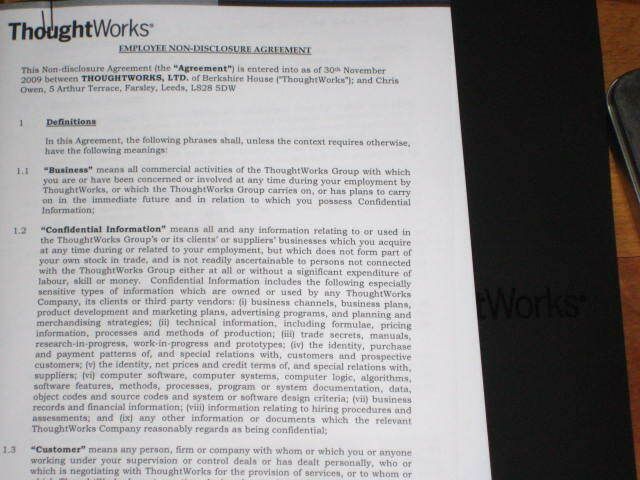 I got just hired by Thoughtworks Calgary and will be starting in January. I learned a lot from your blog post about the interview process. I think I had the same feelings over the course of the day as you did. Sure is, are you from the U.K? If so will you be in London for the 5th? Oops, just noticed the “Calgary” part, I guess you’ll not be in London for the 5th then :-). Good luck, maybe we’ll end up on a consultancy together at some point. I am done with the assessments and have my technical interviews on Monday. I am really really nervous for that. I am an engineering student (2012 pass out) and know C++. I have strong OOPS knowledge and my concepts are clear but I don’t have any knowledge about JAVA or any other OO language. While your blog is a sure help, I would appreciate your suggestions on how to prepare for the interviews and also the key points I should focus on. What are my chances since I don’t really know JAVA, ROR etc. Do consider dropping a mail (karishma.walia13@gmail.com). Looking forward to hearing from you. Thanks a lot. ps- My interview is at the Pune office, India.